Indeed, there is more to worship than musing a good voice through the microphone. Worship is an experience that seamlessly connects man to God and thus, it is necessary that it be done right. With this in view, an organization called Effective Worship Seminars is putting up an educative conference to enlighten singers on the dynamics of effective worship. 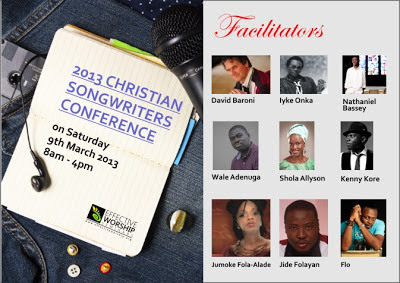 Tagged "2013 Christian Songwriters Conference", the event is scheduled to hold on Saturday March 9, 2013. It will have two sessions held within 8am and 4pm. The venue for the conference is AGDC Training Centre, 5 Maitama Sule crescent, S.W. Ikoyi. The conference parades a host of reputable facilitators ready to pass down vital information on effective worship in their presentations. 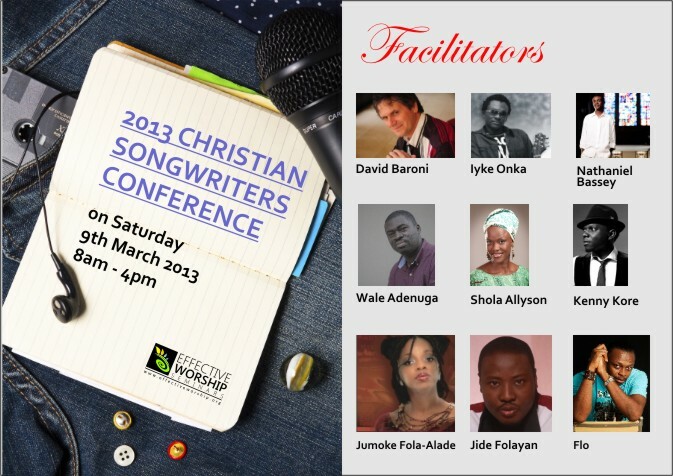 Speakers at this conference include David Baroni, a grammy award winning Songwriter. His songs have been recorded by Don Moen, Ron kenoly, Michael W. Smith, amongst others. The other speakers are Wale Adenuga, Nathaniel Bassey, Iyke Onka, Shola Allyson, Kenny Kore, Flo, Jumoke Fola-Alade and Jide Folayan. This conference is quite impact-centric as it will take attendees from the basics of song writing to other professional aspects of music ministry. - Song writing master classes with David Baroni and other select artistes. - The digital platform: New ways to market your music and engage your audience. Registration fee is N6,500 per person. This fee covers tuition, lunch, Songs from heaven (a book by ace songwriter, Tommy Walker), LIFTED 3 cd and conference materials.